You get a sense of that boisterous, ebullient moment in this recorded re-creation, straightforwardly titled, “Llegada De Madero A La Ciudad De Mexico” (literally, “Arrival of Madero to Mexico City”). Interestingly, the story is told from the perspective of people in the crowd waiting for Madero’s arrival by train. In a half-humorous, colloquial dialogue, they express their excitement, estimate the size of the huge crowd, and talk about how hungry they are because they’ve been waiting so long to get a glimpse of their hero. 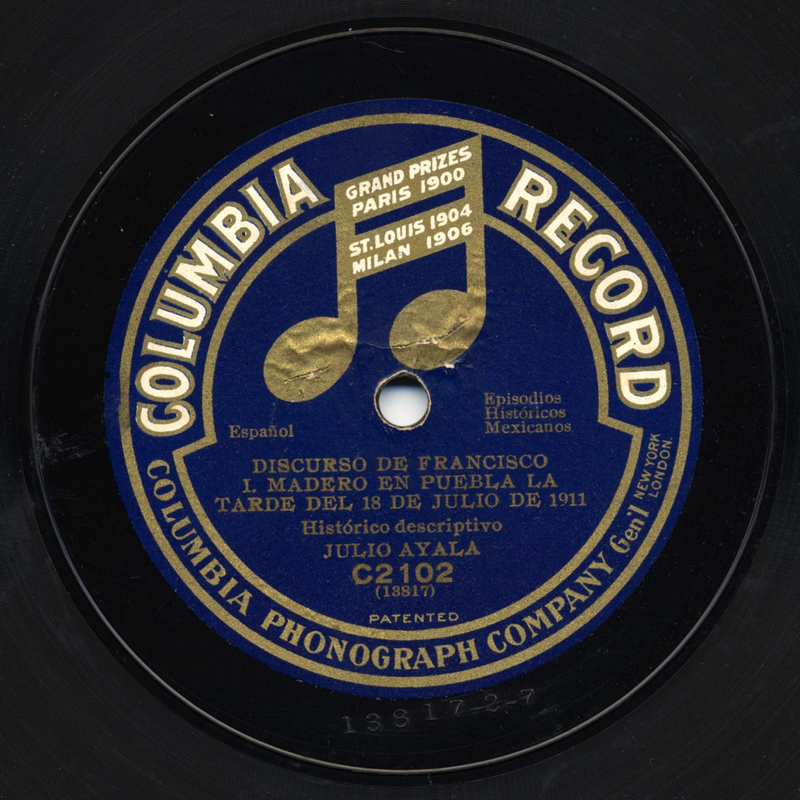 That morsel of historical trivia points to the potential educational uses of these historical recordings. A high school history teacher, for example, could encourage students to study these dramatized accounts, discuss the characters, and see how faithfully the reenactments reflect the real facts. 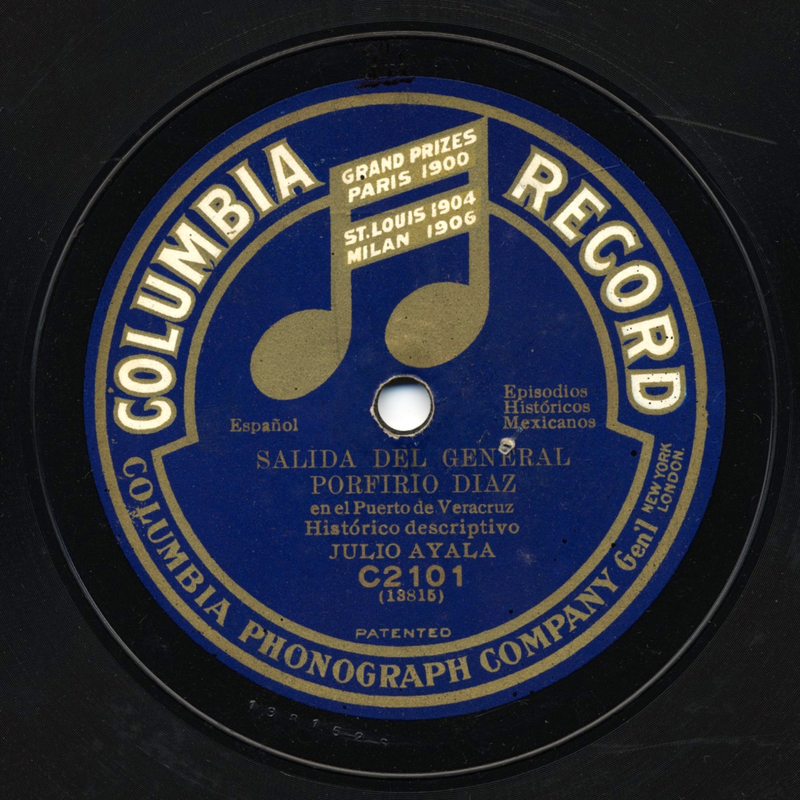 Students of history can relive another important chapter of Madero’s revolt in the dramatization titled, “Salida Del General Porfirio Diaz (en el Puerto de Veracruz).” This mini-play, sounding a lot like the old radio dramas of the 30s and 40s, reenacts the moment the deposed dictator boarded a ship at the port of Veracruz that would take him into exile in Europe. At first it seems to glorify the ousted strongman, with a military flourish and cheers for Diaz and yet another historical figure, Victoriano Huerta, the military leader who would soon turn against Madero. After a pompous and patriotic introduction, Diaz addresses the assembled crowd to say goodbye, invoking the usual symbols of righteousness – the homeland, the flag, and the Almighty. Diaz then wraps his defeat in patriotism: “Gentlemen, I have resigned because I want no more Mexican blood to be shed” (“Señores, he renunciado porque no quiero que se derrame más sangre mexicana”). And his voice chokes up when he mentions his children and the gathered military cadets, whom he considers his extended family. Then, we finally hear the vox populi, people in the crowd speaking in a vernacular that’s in sharp contrast to the stiff and formal language of the military speeches. One man asks why Diaz got a presidential send-off when he had already resigned his post (“si ya dejó la chamba”). They must be under orders, responds another man, and orders must be followed. That brings a retort extolling the new freedoms for people under Madero, closing the recording on a revolutionary note (“Gracias a Madero, todos podemos gritar recio y gordo”). That was certainly premature. Hostilities in Mexico were just getting started. Madero was elected president in November of 1911 and less than two years later, he was dead. The story of his ouster is one of betrayal and backstabbing by Huerta, who conspired with the U.S. ambassador to stage a coup. Huerta had Madero imprisoned, along with his loyal vice president, José María Pino Suárez. They were shot and killed while being transported to Lecumberri prison, in northeastern part of today’s Mexico City, ostensibly for their own protection. Guards claimed they tried to escape, but many people believe Huerta had ordered the assassinations. So now Huerta, the hated traitor, turns up in another recording, calling for peace in a strange speech to Congress less than two months after Madero’s murder. In “Discurso Del C. Presidente Gral. DN. 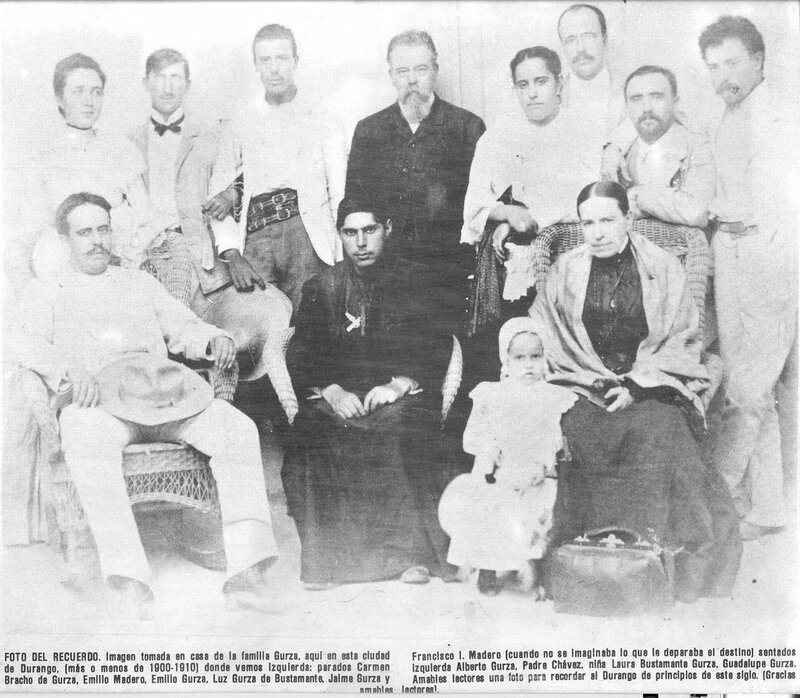 Victoriano Huerta,” delivered on April 10, 1913, the new president proclaims his religious leanings and his indigenous roots (he was of Huichol ancestry). Then he calls for building schools and helping the Indians by the government imparting “the Eucharistic bread of education” (el pan eucarístico de la educación). Finally, in the name of God, Huerta calls for Mexicans to “work united for the good of the country, this country so beautiful and so unfortunate” (“Trabajemos unidos por el bien del país, este país tan hermoso y tan desaventurado”). Soon, Huerta too would be gone, exiled after the U.S. turned against him and sent Marines into Veracruz. His demise – including his eventual incarceration in Texas on charges of sedition for conspiring with Germany against the United States – provides a dramatic, almost unbelievable denouement to his life and shameful role in the revolution. Huerta is still vilified by modern-day Mexicans, who refer to him as El Chacal (“The Jackal”) or El Usurpador (“The Usurper”).That sentiment is well captured in this corrido entitled, “Crimenes De Huerta,” by Los Llaneros De San Felipe. Dejando el suelo manchado con sangre de mi patriota. Y que al noble de Madero vilmente lo asesinó. and the Whole Civilized World Stands Aghast. In this digital age, it is hard to imagine a time when news was not available instantly. We’re used to witnessing historic events, from assassinations to tsunamis, as they happen. A century ago, however, news didn’t travel so fast, and of course there were no sound or images in print, which was how most people got their news. So from the very early days of the recording industry, attempts were made to bring some immediacy to news accounts by re-enacting and recording historic events. These dramatizations brought print accounts to life, creating the “you-are-there” feeling long before newsreels actually brought events to movie audiences. Recorded reenactments of historic events even date back to the late 1880s, available on early cylinders for 50 cents each. In Mexico, the great muralists also worked to capture the dramatic sweep of history through their grand and colorful paintings. Madero’s story is vividly represented in a 1969 work by Juan O’Gorman which carries the revolutionary’s slogan as its title, “Sufragio efectivo – No reelección.” (Waiting for this link to load is worth it, allowing a virtual exploration of many mural details.) 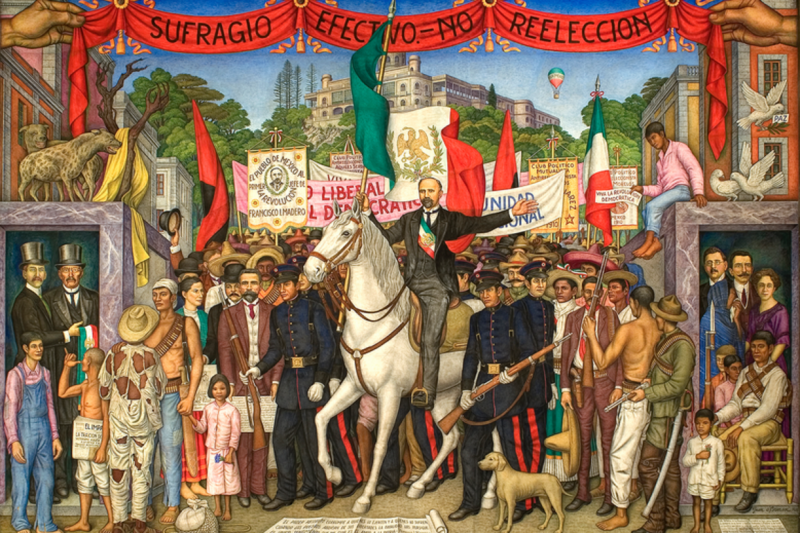 The mural shows Madero leaving Chapultepec Castle on April 9, 1913, the start of the Ten Tragic Days. The principled speech he is to deliver is unfurled at the feet of his white horse. To the left, Huerta and Wilson, the U.S. ambassador, conspire in a corner, their dark betrayal symbolized by two hyenas above them. To the right, we see the vice president and Madero’s wife, Sarah Perez, who pleaded with the American ambassador to protect her husband, to which he responded that he couldn’t interfere in Mexico’s internal affairs. 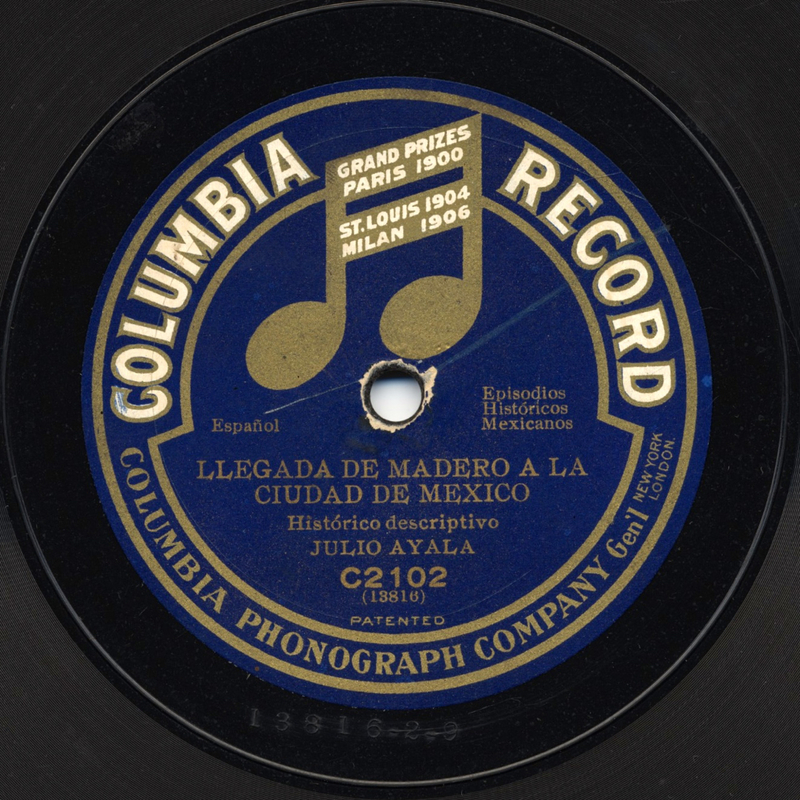 Finally, the whole, heroic story is also captured in this song, “Nuevo Corrido de Madero,” by Camacho y Pérez. The song also mentions Madero’s widow, who, while in exile in New York, helped finance the counter-revolution against her husband’s killers. These corridos provide another example of how the arts in many forms – music, painting, theater, and writing – help keep history alive.